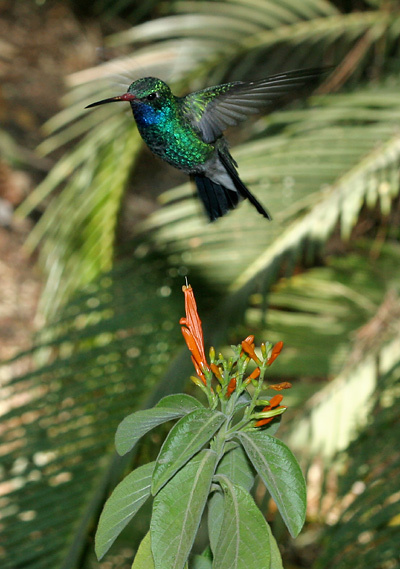 Broad-billed Hummingbirds (Cynanthus latirostris) are common here in southeastern Arizona during the spring, summer, and early fall (March through September), but they are rare here during the winter, and the best places to see them at this time are in gardens with flowering exotics and hummingbird feeders. 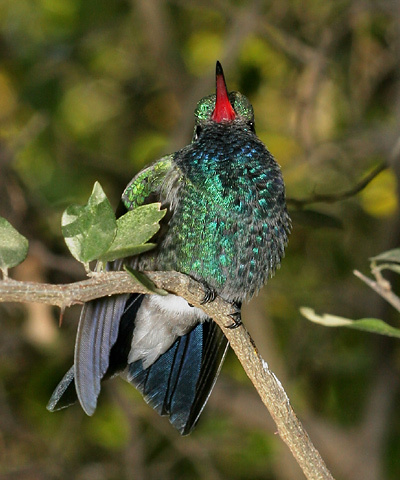 I spotted this wintering male Broad-billed Hummingbird in the hummingbird garden at the Tucson Botanical Gardens in early February of 2006. He was very tame and didn't seem to be at all bothered by the many people and cameras. In fact, his only concern was with other hummingbirds. The hummingbird garden was filled with blooming hummingbird flowers, and this little male Broad-billed Hummingbird was vigilantly guarding this rich nectar supply from other hungry winter hummingbirds. 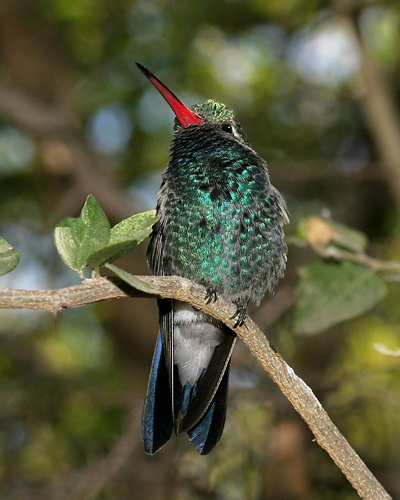 Male Broad-billed Hummingbirds are iridescent green with a blue throat and a red, black-tipped bill. 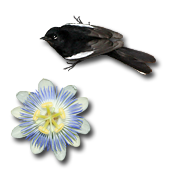 Female and juvenile Broad-billed Hummingbirds are iridescent green above and pale gray below with a white line over the eye, a dark ear patch, and a black-tipped bill with a mostly black upper mandible and a dull red lower mandible. This female Broad-billed Hummingbird below was a spring visitor to my Tucson hummingbird feeders. 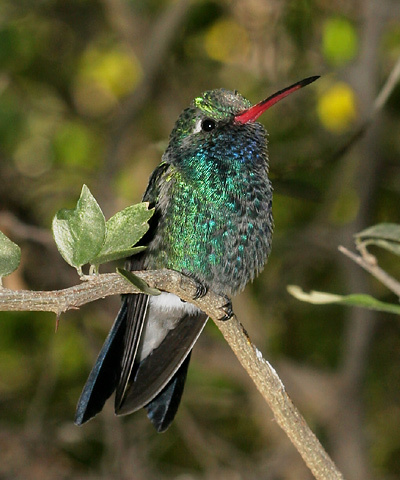 Despite their common name, the bills of Broad-billed Hummingbirds don't look especially broad when seen from the side, but when seen from above or below, they do appear broader at the base. 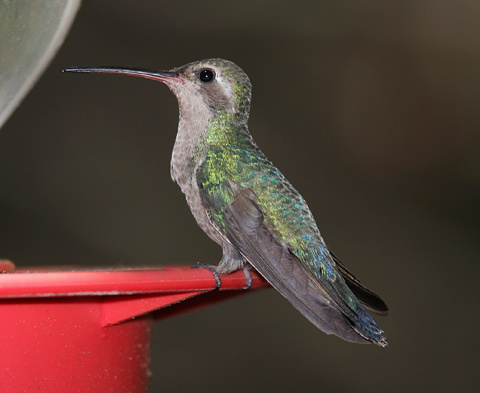 Broad-billed Hummingbirds are supposed to migrate south to Mexico for the winter, but because of the large number of hummingbird feeders and winter-blooming ornamental plants here in Tucson, increasing numbers of Broad-billed Hummingbirds have started spending their winters here. As I was watching him sit perched on his branch, this little Broad-billed Hummingbird fluffed up his feathers and began busily preening himself while still keeping a vigilant eye out for other hummingbirds in his winter territory.